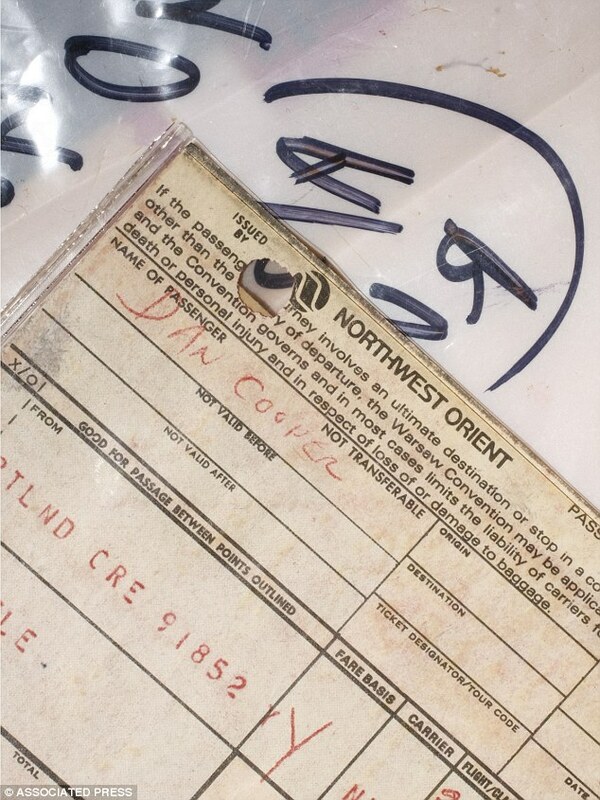 On the day before Thanksgiving in 1971, a man boarded an airplane in Portland, Oregon under the name "Dan Cooper." He took a seat in the rear of the plane and lit a cigarette. He ordered a bourbon and soda and waited as the plane took off. Soon after takeoff, he handed a note to flight attendant Florence Schaffner. The note demanded $200,000 in $20 bills and four parachutes. He opened his briefcase and showed the flight attendant what she believed was a bomb. 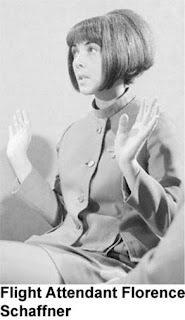 She gave his instructions to the cockpit and when she returned, the passenger was wearing dark sunglasses. The FBI gathered the money in unmarked bills but made copies of each of them. The plane landed, the passengers disembarked, the money and parachutes were passed to the crew, and the refueled plane took off with only the hijacker and the crew aboard. The hijacker had very specific instructions for takeoff, including demanding that the rear exit door remain open with the stairs extended. Twenty minutes after takeoff, he ordered all of the flight crew to lock themselves inside the cockpit. At 8:11 p.m., the crew felt a sudden change in the pressure in the plane. 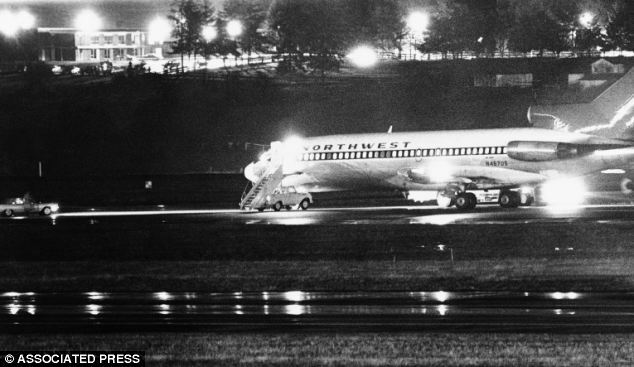 Despite the fact that there were planes following the hijacked aircraft, no one witnessed his exit. The area where he might have landed was thoroughly searched and he was never seen again. Did he get away with it? 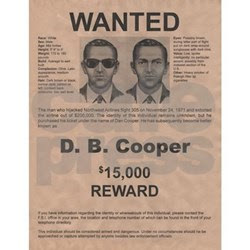 The FBI published the serial numbers multiple times, offering a reward for any information. The serial numbers never resurfaced...until 1980. 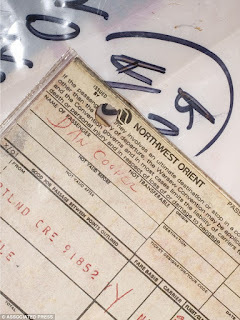 That was when an eight-year-old boy discovered three bundles of the ransom cash on the Columbia River. The discovery brought more questions than it answered. Had someone else discovered the ransom cash and buried it there? If D.B. Cooper survived the landing, why didn't he use the money? Did he escape to another country and exchange the American dollars for foreign currency, losing only part of the money? What do you think happened to D.B. Cooper? Or was he actually one of the crew members and they were all in on it? Although even for the time, that's not a lot of money for hijacking a plane. Haha, good point! It does make you wonder why he didn't go for more money. Really scary stuff! Flying today is especially frightening. I try to avoid it when I can. I haven't flown since 2011. It's possible he got away with the rest of the money and if so probably had accomplices on the ground. Seems like a very elaborate scheme. I believe that's possible...he definitely had to leave the country, though, unless he found a way to spend the money without it ever being reported to the government. LOL, some people don't like stories without resolutions. I like to imagine all the possibilities. That's true. It's what we DON'T know that makes life interesting. I agree...he wouldn't be the first person to vanish in the woods. In fact, it's disturbing to me how hard it is for people to find missing people in those areas...even with all the tech we have now. The D.B. 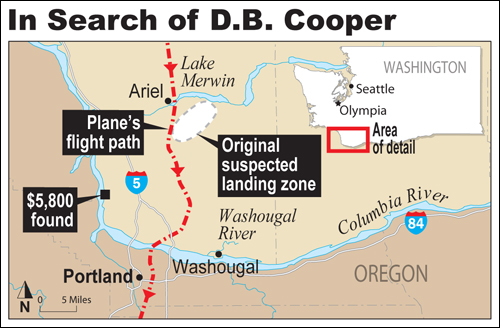 Cooper was one of the most extensive in U.S. history at the time and they didn't find a single sign of him or the parachutes. I wonder if they gave him faulty parachutes? All four? That's one of the mysteries that could go on forever. I'd love to be able to research it in great detail. There's plenty of information out there about him. I believe there's even a book or ten! I'm wondering why 4 parachutes. He needed one for himself of course, who used the rest of the parachutes? He must have tied the money briefcases on the parachutes. How much $200,000. in$20 dollar bills weighs? Was he familiar with the area he was parachuting in. Did he take parachuting classes? Where? It does seems mysterious that money was found later but not D.B. Cooper. He must have been familiar with how to use a parachute. I wonder if he asked for four in case they gave him a defective one, but there's only so much time to switch between parachutes...I've never parachuted, so I'm not sure what's involved, but eventually it seems you'd run out of time. I think the F.B.I. probably rigged the parachute so that it would malfunction and he landed with a splat. Some thug found the dead body and took some money and buried the body somewhere. Haha! That's what I'm thinking--all four parachutes could have been defective in a way he wouldn't have noticed until he was already on the way down. The FBI would know how to do that, for sure. Right...it's possible he fled to another country and exchanged it. And the govt. offered a reward for info. on the money, but that doesn't necessarily mean every business and consumer was watching for those serial numbers. I'm sure some businesses were diligent about it, and today there would probably be sophisticated ways for banks to track any serial #s that passed through, but back then? Not so much! This may well have been the mystery that got me interested in these types of things (either him or Amelia Earhart; can't remember). I really like the "they were all in on it theory", but then I do love a good conspiracy plot. I am loving these posts; they're one of my first stops when I enter Internet-land every morning! I recently had to write a news piece for one of my clients about a new discovery about the Bermuda Triangle. They believe they may have discovered a possible theory...blowouts of methane gas that would have sucked ships down. However, that does not at ALL explain the missing aircraft in the area. Omg I saw this story on ID network! Crazy!! Your theme is really fun this year. I wonder if D.B. Cooper used one or more of the parachutes to send some of the money in a different direction so they wouldn't know where he landed? Cool story! That's a good thought! And parachutes can be pretty unpredictable...so he might have been unable to track it all down. I just watched an episode of Mysteries at the Museum that went over this mystery. It is fairly popular. It's one of my husband's favorites. I'd never even heard of this until he told me about it. I've always wondered about this story. Where did he go. If he died they would have found him in the search. I haven't a clue where he went, but he went somewhere never to be seen again. Wow, this is a real mind bender. How many planes followed? Just one or more? Perhaps he paid someone off in the plane following closest to not report his departure, but that doesn't explain anyone else missing a parachute opening. And why four parachutes? If they found the money, he must have landed safely, somehow. But what happened to the rest of the money is another mystery all together. What a puzzler. This is one of those mysteries that keeps being mentioned locally in Portland. All sorts of speculation as to what happened and where is he now. Is he still alive? No one knows for sure. I knew the name was familiar. I've friend's family ge watching Leverage for the past couple of weeks. And they received a case to find DB Cooper in season 5. 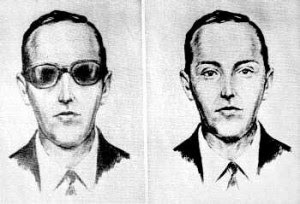 On the show he left the money to a friend's, married the stewardess and became an FBI agent to help his partner work on the case of catching DB Cooper. Maybe, in real life the money found was meant for his partner who didn't want or showed up to get it. And probably still alive somewhere, if not passed away already, and enjoying his life. Hate auto correct...meant "I've been binge watching Leverage." Hmmm...Very intriguing! I love thinking about all the possibilities! My guess is he had an awesome plan thought up, and something happened to get that plan off track. I think he probably was able to make it to another country. Maybe he buried the money himself to throw others off. Such a great mystery! I have nary a clue! This story has fascinated me for years! What if he became tangled in trees and died there? Since only part of the money was recovered, it would seem he actually did get away with it and probably made it out of the country. This was such a hot story for so long. Someone even opened a bar here in town called D.B Coopers! I've never heard this one before, but you're right, it leads to more questions than answers. Pretty sure he didn't survive the jump otherwise he would have taken the money. This could be a film. I'm thinking he didn't make it. I doubt he'd go through all that and not take the money with him. That's always been such an interesting case. I'm not sure what happened to him, but I'm thinking he probably escaped with his life if not the money, since we've never found his body. Fascinating story. I love a good mystery! I remember this from 1971 and since that time I have seen what seems like countless articles and TV shows about what might have happened. I think he's dead and the money is scattered all over the area where he jumped. But who knows? Wow, what a strange mystery! It definitely leaves me wondering. I remember this event, and I have no clue what happened to him. I doubt it could happen now with all the layers of security around air travel. Wow! I have never heard about that one. That is a true mystery! What did happen to him, I wonder? I'm telling you, Stephanie, you are picking some great ones! Ah yes, the famous DB Cooper. This one fascinates me. I didn't know you could parachute out of a commercial plane. If the three bundles were found, maybe he didn't make it. We'll never know, I guess. Ooh, this was a good one. More my speed. Murders freak me a bit. I think he went on to live a regular life with a job and family. He could have dropped the 3 bundles. I can only hope we find out the truth one day. Pretty dangerous what he did. I don't think he survived. I remember that story - as kids we would throw theories around. I always thought he got away. Scary stuff and conspiracy theories! Intriguing post, this one. I would think if he made it out alive and well, he would've taken all the money with him. I feel like I might have heard this story before, but nonetheless it's amazing. It makes the brain boil trying to figure it out. Now I want to know where did he go? What happened to him? I always just assumed that he died after jumping. I am more shocked to learn that they use to let you smoke on a plane. I remember reading this more than once and was always intrigued by this. I saw some TV show about this a few short years ago and it seems like they may have figured out who he was. I can't even remember his name now...bummer. It I believe he died of cancer. He kept to himself and they found a lot of the money in his home, hidden. He just lived simply and incognito. This mystery has intrigued and stumped me for years. I always thought he got away with it. I haven't thought about it for a long time and I can no longer even remember what/why my reasoning was for the one suitcase of money being found, but at one time I did have an answer for that. It probably wasn't a very plausible answer, but I did have one. Obviously, he had a partner (more than one). I believe there was a confirmed sighting, wasn't there? I think my answer for the money had something to do with where he landed and that particular bag of money being stuck in a tree. Dang, I can't remember anymore, but I feel certain that he successfully escaped, lived through the escape and exchanged the money in another country. That one bag of money that was found didn't make it to Europe because when he jumped from the plane it was caught in a tree. I don't know how long he survived, but I truly believe he made it off that plane and lived for many years with the money. I knew of this story and remember when it happened but i think it is much like JFK -- we will never really know what happened.